It's official! Disney are still planning to make more Alien movies following their recent acquisition of 20th Century Fox! 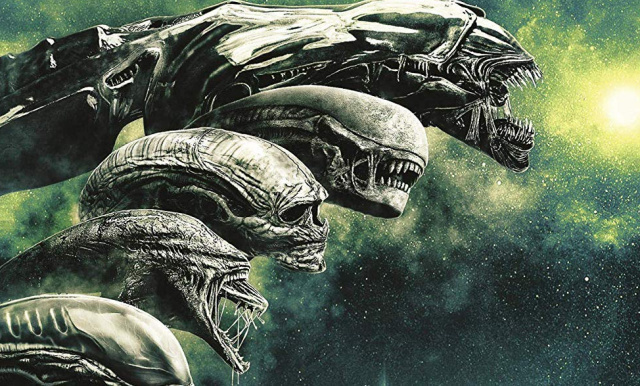 Initially, the fate of the Alien franchise remained uncertain leading up to the Disney - Fox deal and although we had received a few tid bits of information over the past 5 months suggesting the future of Alien remained bright, up until this moment, no official acknowledgement by the studio, publicly, had confirmed those earlier reports - until NOW. Previously we reported that according to a Deadline news story, Ridley Scott and his production company Scott Free were still involved and apparently actively working on another Aliens (?) Sequel. Whether or not the next Alien film by Disney will be a continuation of Alien: Covenant or not remains to be seen. Either way, this is extremely exciting news! Stay tuned for more news on the future of Alien! 23 Fan responses to Disney officially confirm they will be making more Alien movies! "Fox's Emma Watts came out to introduce Dark Phoenix, calling it the "perfect sendoff for our X-Men team." The Marvel mutants have been at Fox since 2000's X-Men movie, which is credited with launching the modern era of superhero films. "We intend to do our part, and it is in that spirit that we will continue to create new stories,” she said, name-checking Kingsman, Alien, Planet of the Apes and Avatar." Thanks for the added clarification daliens! Wonderful find! I will believe it when I see a teaser trailer from Disney. They didn't seem to give any kind of year, so I won't hold my breath. Bring on Alien: The Play- at least that is something concrete with a Scott Free endorsement- IN WRITING. 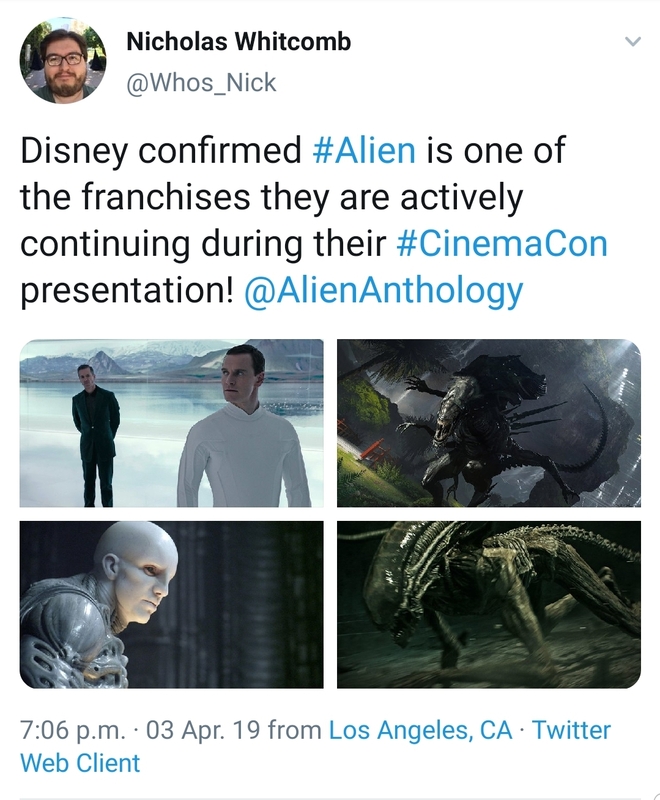 Another report from CinemaCon 2019 confirms that Alien footage was shown in a sizzle reel celebrating the big franchise from both Disney and Fox. Another report mentioned the footage was from Alien: Covenant. That's encouraging. "The Disney presentation at CinemaCon kicked off with a video that had all of the Disney and Fox properties mashed together. It was a little surreal to see Alien and Frozen in the same sizzle reel but Disney was very thankful towards everyone at Fox for all of the hard work they have done. " I think this is Good News on ONE Hand, but maybe wont be the News that some would have hoped. It depends on what Disney Deem is worthy to continue within the Franchise.... and so we cant ASSUME we are going to get a Continuation of the Prequels or anything related to Ridley Scotts Direction. However who knows, we had rumors that Ridley Scott is working on a ALIEN Project, and Emma Watts seemed to be behind the Direction that Ridley Scott wants which is to FINISH the Prequels and to not have any TV Series at Present. She had said the Franchise was Not Finished and that its a case of finding the RIGHT STORY, and it seemed she indicated that you cant keep going back to the same Tropes/Formula that we saw in the ALIEN Franchise. But i am concerned that THIS is exactly what Disney wants to see in the Franchise. The ALIEN Franchise would be expected to be about the Xenomorph to some degree or another and i dont think they would want to STEER to far away from that... Neomorph's, Deacon's, Trilobites and Spores are all loosely connected and i feel that DISNEY would want to continue with at LEAST this level of connective tissue if not more Xenomorph Related. So by NEW Movies maybe we could get a set of movies that are independent of ALIEN and PROMETHEUS but can have some links, but will NOT literally connect to a David's Story or a Ripley's Story. Maybe we could get 2-3 Stand Alone Movies that are not connected/lead to each other so to speak. They could open up the Franchise so we DONT just have the ARC/Plot that Follows that Fateful Day the Nostromo Crew arrived at LV-426... to the Hadleys Hope Colony being set up on the same World that housed the Derelict and its Cargo, to the Pursuit of Ripley as a Source for the Xenomorph after the Destruction of Hadleys Hope. The ALIEN Franchise was about that Cargo on the Derelict, and what becomes of it to the point that the Company had tried to get a Queen from Ripley, and then Clone her 200 Years after. We have to ASSUME they did this because there was NO other Source.... but the Prequels open up the Potential for other Sources of Xenomorph or Related Organisms... i would like to think that each AVENUE that is explored like this will conclude with the Destruction of any Specimens, resulting in the Company eventually having to pursue Ripley. Likewise we have the Prometheus ARC/PLOT which follows David and how he has used the Secrets of the Engineers and Bio-Weapon Black Goo to Create the Xenomorph that we can ASSUME eventually ends up on the Derelict on LV-426. But this still opens up a AVENUE to have a Movie or Movies set to explore routes connected/opened up by the Prequels but without actually being set following what David is doing at Present. But again any such Avenues should conclude in a way that would show that NO-MORE Specimens are obtainable from this route... and hence the pursuit of Ripley. So indeed their is Scope to have a ALIEN movie that is a Parallel Story that is Canon (No Alternative Universe) but i feel any such Movie must have some connective tissue to ALIEN and thus has to be more ALIENY than Prometheus. Eventually such ALIENY movies that can also include the Engineers, may open up more fans to be willing to see further movies about the Engineers that Will-Not have any Connective Tissue/DNA to ALIEN, so even less so than Prometheus.... but we have to engage the Fans who are NOT SOLD on the Engineers with more ALIENY movies that can introduce the Engineers into the Fold. I do fear HOWEVER... that NEW ALIEN movies could be Alternative Universe Variety, i am concerned they would also go with a Blomkamp Alien 3 Alternative and BRING BACK the Gang from Aliens. I would like to see a continuation of the Prequels... i think we need a CONCLUSION or at least some Movie in the Aftermath of Origae-6 that will give us more clues to the Xenomorph Cargo on the Derelict's Origins.... OR show us evidence to show that Davids Creations Do-Not get onto the Derelict. Because as Ridley Scott said, there is only so much Snarling and Chest Busting you can do, and i would also say there is only so much you can do with the RIPLEY Saga.. before we are back to the Drawing Board! And i think the Space Jockey/Engineers are a Good Starting Point to Return to and Focus on in the FUTURE! I think, the main thing - return to biomechanical aesthetic. No stone age and no wooden villages in David's world. No Earth plants. Disney got my trust with Star Wars classic aesthetic. And I'm sure - they go back to biomechanic. I think this was the Plan with Alien Covenant, Ridley Scott had mentioned we are NOT QUITE there yet, as far as our Bio-Mechanical Xenomorph.... we can all Guess what that means. Alien Covenant had toned down a lot of the Bio-Mechanical Aesthetic, i think this is one area of disappointment as LV-223 certainly had that Aesthetic.. while a bit more on the Mechanical Side. Prior to the Plot Turn in Alien Covenant (Xenomorph was created by David) we could see in Prometheus there was a shared connection between LV-223, the Engineers Technology and the Xenomorph. So i think you have to go back and introduce that Bio-Mechanical Look, it would be nice to see it on some World, but i think we have to look at the FACT the Engineers possessed similar, so its a case of WHERE they use/keep and create this Technology or WHERE did they obtain it from. If this is via another Layer of Creation, or another Race or Element, then i think this could be a route to certainly explore and get us back to something more ALIENY because the Eggs were not the only VERY ALIEN part of that Derelict Ship. Great news! and about bloody time. Good to see things are no longer dead in the water. SWEET! I'm exticed about it and the more Maze Runner movies. I thought the third one was the last one but nope. Alien franchise wins an online survey made by Sciencefiction.com after the announcement that Disney will continue several Fox franchises. The vote is still open, let's give a helping hand. That's the spirit, you lurking Alien fans from around the Universe, out of your cryosleep. Show your live for your favourite franchise, while the poll is still open. Let's have a drink. Cheers. This is looking good but I worry only about 100 people have voted including myself. This article has over 30k reads in less than 24 hrs, there should be more votes, I suppose. I think the only POLL that would be better would be on say IMDB or Rotten Tomatoes or even on Disney/Fox. As it would cater the wider Public. But certainly i think the Poll would not tell the Full Picture, i would say AVATAR is a 100% Certain... The Planet of the Apes is fine as a Stand Alone Origins... but i think they would be Money to be Made from Continuation, thanks to HOW WELL made the First Reboot Series was. The Alien Franchise? I am not so sure... the Franchise has had its Fair Share of Disappointment and Fractured Fanbase... And while Every Fan could go and see a ALIEN movie and by Fan i mean those who own various Box Sets and Merchandise... but would that be enough to make the kind of $$$ to make it worthwhile? Its about getting the Casual Audience involved too. I think its nice to see the Passion for the Franchise, and hopefully those at Disney are taking Notice... but its about FINDING the right Story/Path to take. Over 92k reads for this article in 3 days, that shows the interest for the Alien franchise! Best news I have heard in a long time!! 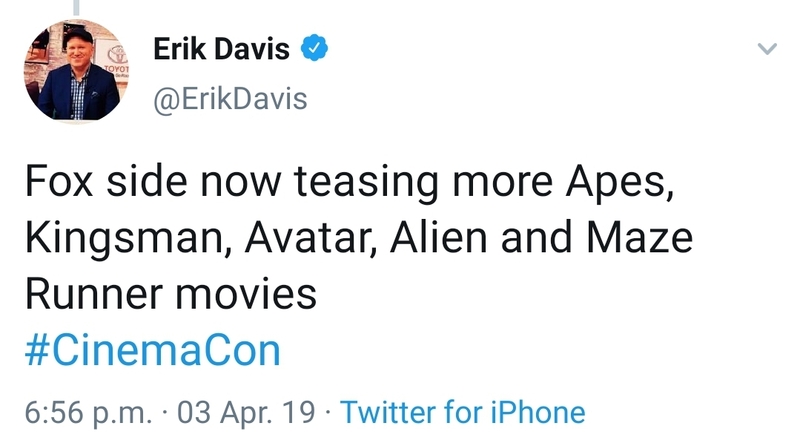 That sounds nice I guess but please no more movies about David. I am all for making things like the small shorts, that is fine but the way that the big movies are doing (by big movies I mean things like Alien, Aliens – you understand) is not good. The last one was a disappointment so I do not want anything like that. I am not against exploring more about the Engineers or maybe the company but F another android story. Something that involves the goo in some way could be interesting to see although I am not sure how that could be done and by the way that David babbling short about it is not in the movie so to me it is not official at all. Rumors about Scott working on an alien-project could mean anything. I am sorry but until I see something concrete I am remaining skeptic, I think that is the best thing to do. Don’t retcon Alien 3, I would be very disappointed if they did so. If that would be the case I would sure boycott that movie. Getting some movies that are independent from each-other might not be a bad thing. Get a good story and characters that we can get behind and a lot of it is fixed. Yeah, find other ways that do not involve a queen (it has been done many times before, it gets stale). I would not mind another alien movie that does not have Ripley or David in it, I would rather welcome it. Having more movies that include the Engineers is fine by my as long at it is clear that it is in the alien franchise, and that does not mean that we always need Xenos. LV-223 was more interesting than the Engineer planet in Alien Covenant and it was also darker which meant that more things were in the shadows compared to AC. I agree with Cerulean Blue about the Engineers (sorry if I misspelled it). Daliens: Well 92000 of which of many might have read it many times isn’t that much if you look at the total of the world’s population but yeah it is interesting. Alien covenant had a profit of 260 million dollars, with a budget of 97 million dollars, in 2017. I think they are still making money with This movie. It's not a smash hit, but it's obvious that exists potential to make at least One more movie or/and a TV series.